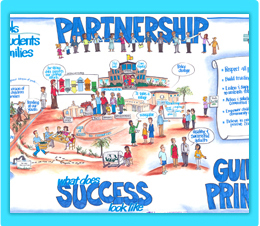 Partnerships are paramount to the success of the Santa Fe (New Mexico) Public Schools SS/HS Initiative. The Santa Fe School District found that its teamwork with key community agencies and children’s health advocates had the most significant positive impact on school discipline. By collaborating with Santa Fe Regional Juvenile Justice and its own SS/HS partners—the police department, local mental health agencies, the Juvenile Probation/Parole Office, and the Children, Youth, and Families Department—the district formed relationships with an array of agencies rooted in the community. The partners worked together to review a body of cases involving students who had at least two juvenile arrests and a history of running away. Meeting on a weekly basis with a case manager, partners combined their resources to support the identified students. In the process—which included site visits to the Detention Center and runaway youth shelters—they learned how each of the different systems worked, how the systems’ vocabulary differed, and how to work together toward the goal of prevention rather than punishment. After the publication of the Children’s Defense Fund’s America’s Cradle to Prison Pipeline, which examined the relationship between school discipline and youth incarceration, the partners studied the report’s findings as a group and recognized that their community did not adequately address students’ needs. Based on the risk factors identified for the Santa Fe community, the partners collaborated to map all the services and supports available to youth. Their next task was to develop a strengths-based systems integration plan to provide resources and supports, filling the gaps to adequately address risks. The partners’ ability to work together as a team, along with other interventions and staff training, has contributed to positive outcomes—an 11% reduction in adolescent arrests, reduced suspensions and expulsions, and reduced police calls to school sites. This synergy between partners resulted in a mechanism for sustainability of the process beyond the life of the SS/HS grant.